no that is not a typo, I meant to say inside not outside. Outside it is a balmy 19 degrees (Celsius) and a light breeze. Inside it is a not so balmy 11 and my hands are shivering whilst typing (note to self: get some fingerless gloves). The only heated room in the house is kid's bedroom, so not a lot of sewing has been happening since the sewing machine lives in the dining room and that is the coldest room in the house (currently measuring at 9 degrees Celsius). Instead I have been knitting and crocheting in the kid's bedroom. 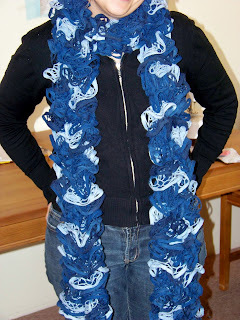 One blue ruffle scarf to replace a rather ratty looking one a bought 5 years ago. My goodness! I do hope heat makes it to the rest of the house soon. In the meantime, if you want to crochet fingerless mitterns, here's a quick and easy pattern. I made them last year and love them. 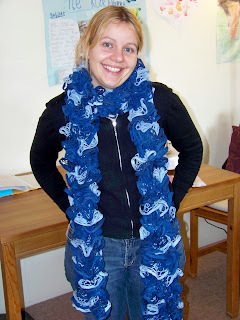 That is scarf is very cute! Another Jennifer ! Where did you find the scarf pattern ? I think I've tracked down the wool but not a pattern.